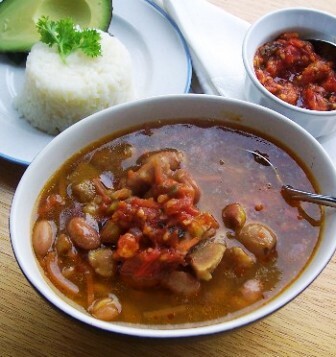 Frijoles Paisas o Antioqueños is a common dish from the Antioquia region. I’ve eaten it all of my life and it is definitely one of my favorite dishes. Few meals are as truly Colombian as this. 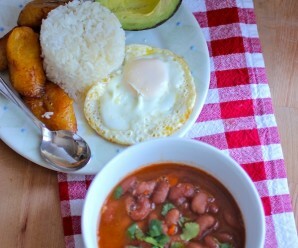 We serve it over rice or as part of our famous Colombian dish “Bandeja Paisa” which is a huge meal including, paisa pinto beans, white rice, ripe plantain, Colombian chorizo, avocado, chicharron (pork fritters), ground beef and fried egg. 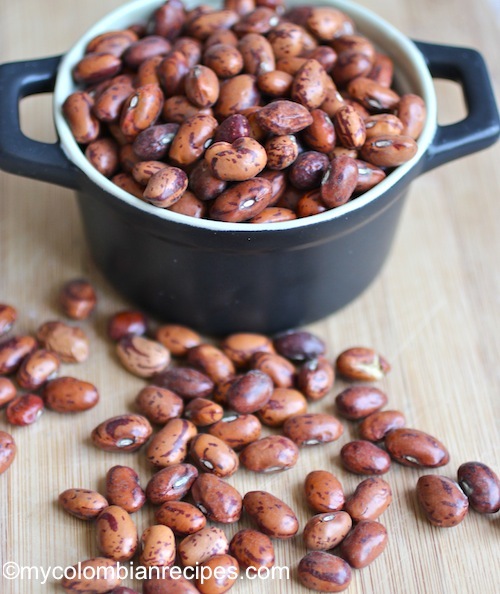 Regular Pot: Wash the beans and soak overnight in cold water. Drain the beans and place in a large pot and add the water and pork hocks. Over medium-high heat, bring the beans to a boil, then cover the pot and reduce the heat to medium-low. Allow the beans to cook until almost tender, approximately 2 hours. When the beans are cooking, prepare the guiso. In a large skillet, heat the vegetable oil over medium heat, add the tomatoes, onions, scallions, salt, garlic, cilantro and ground cumin and cook for 10 to 15 minutes. 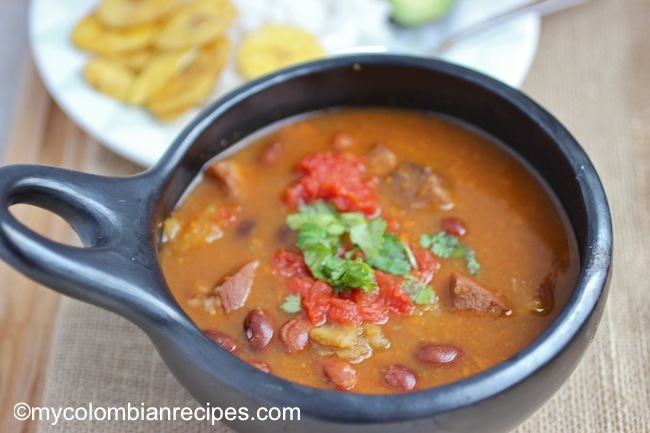 When the beans are almost tender, add the guiso, plantains, carrots and salt. Cover and cook for another hour or until the beans are fully cooked. (Add additional water as necessary). Directions for the slow cooker, use the same ingredients except use just 4 cups water instead of 6. Wash the beans and soak overnight in cold water. Drain the beans and place in a slow cooker, add 4 cups water and pork hocks and cook on high for about 2 hours. Follow step 2 in the regular pot recipe. Add the guiso, plantains, carrots and salt then cover and cook for another 3 hours. Taste for salt and serve. Hi Erica, Love all your recipes. I have a question how do you cook the frijoles on a pressure cooker? 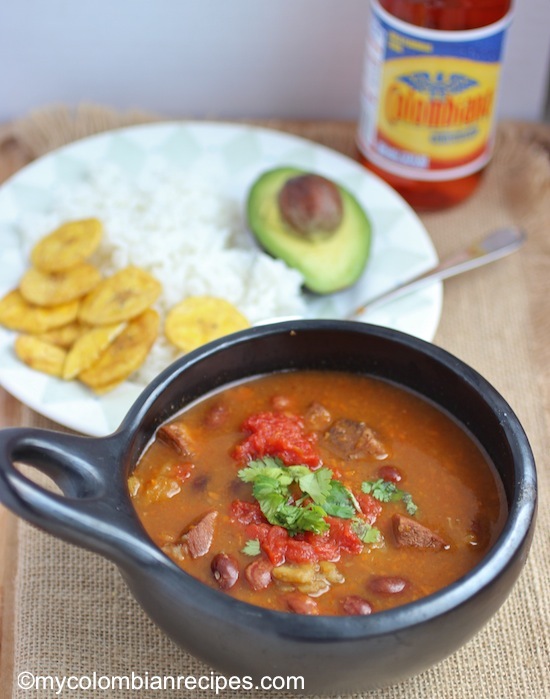 Place all the ingredients in the pressure Cooker,except the plantains and cook at high pressure for 25 minutes. Remove from heat and let rest for 5 minutes. Release the steam, following the manufacturer’s directions. Add the plantains, simmer them with the lid off until tender. I made mine in th pressure cooker today. Came out delicious!! The plantains simmered with the lid off at the end for about 10mins. I personally add the cilantro and scallions separate from the guiso. My grandmother taught me to mix them with some vinegar,fresh lime juice, and a few dashes of hot sauce. This makes for a garnish that I use for the beans when serving. Hi Erica, I am from Medellin and been in the US for some time. My family loves this dish but I cannot find the beans like the ones from home. Most pinto beans are too small and don’t have the same flavor. Any suggestions? 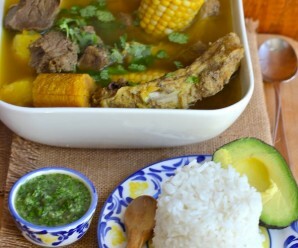 Also, would love to find chicharron to cook but can’t find it either. Thanks in advance! Sandra- I buy frijoles cargamanto or pinto beans and tocino in a Latin supermarket. You can find tocino in Asian markets too. I love this blog! I’m so glad i found it. I’m colombian jewess married with a jewish American guy and he loves everything I’ve made from this blog. 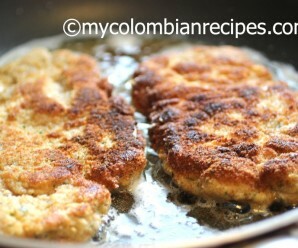 We live in NYC, Brooklyn, and my question is, where in NYC we’re most prone to get colombian ingredients like guascas, guanabanas, raw ingredients to make our colombian recipes? Someone mentioned queens and if so, any particular store or supermarket? I don’t live in NY, but maybe one of my readers can help you. You can look at Latin markets in NY. Mi carniceria favorita es Carniceria Las Americas..en la 45-52 46 Street Woodside, NY ..No es solo carniceria tambien tienen otros productos Latinos. Queens on 82nd st of 7 train stop most of the supermarket around there carry colombian ingredient . This dish was perfect!!!! I made it for my Colombian wife and she loved it. 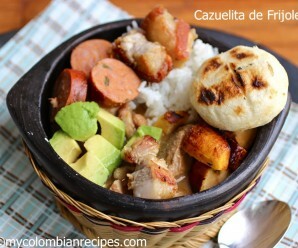 Thank you very much for sharing all these fantastic Colombian dishes. First time I find a recepie as close as my mom makes it back home. I made these beans and they were wonderful! They taste like home(Colombia). Great beans. Thank you! These beans are like my mom’s. I was missing all these dishes. Colombian food is the best. They were perfect and I am going to make them again! Hi! I’ve been trying to find a good recipe for white rice and beans but I’m not sure which beans to get. Do I need to buy dry beans or canned? and which is better if it doesn’t matter? Jenn- I prefer dried beans!!! I attempted to make the beans but they didn’t turn out. They were almost like a stew and not watery like they were supposed to be. Are you supposed to cut the pork hocks and eat them as part of the dish? If not, at what point do you disgard them from the dish? I found that they made a foam in the liquid…are you supposed to scoop that out? 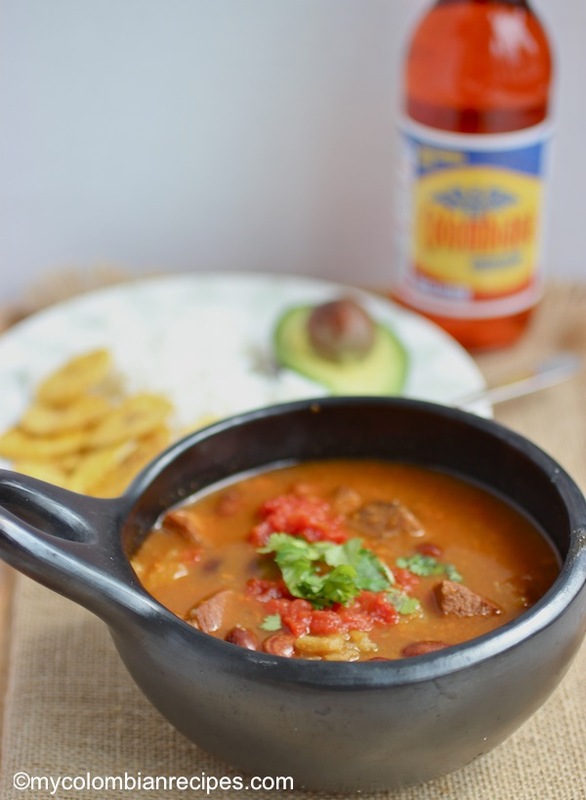 Do you drain the liquid from the beans before adding the guiso? I would like to try the recipe again because it smells good but didn’t look very appetizing like your picture! I used pork belly. You could also sub out with bacon too. Excellent recipe. As good as the real stuff from las abuelas!! 1. I replaced meat with a previously browned (on skillet a few min each side) sweet italian sausage (nothing else in my fridge). 3. Blended the guiso ingredients (I am admit it, got lazy on this one) and cooked as directed. Flavor is the same, consistency a little different. 4. I used slow cooker and without pre-soaking. I added 4 cups of water to a pound of washed beans (no pinto beans, only had small red beans), added the guiso once done, and put it down for 7 hours on high. 5. Skipped the carrot and plaintain (I didn’t have any). Even with mods above for reasons above :), it turn out great!!! Please, do keep putting in slow cooker options. Planning on getting dried beans but I already have cans of beans to use up that are unseasoned and have no additives other than some sea salt as a preservative. What are your suggestions on altering for that as far as amount used and ammount of spices, changes in cooking time, etc? Thank you! Cargamantos are called cranberry beans and you can find them at any gourtmet store like William sonoma or any other supermarket. Theses Friojles came out great. I did need to add a little more salt and I had some trigisal so I added a little of that as well. Once served I added some Aji picante to it and it brought the dish together. 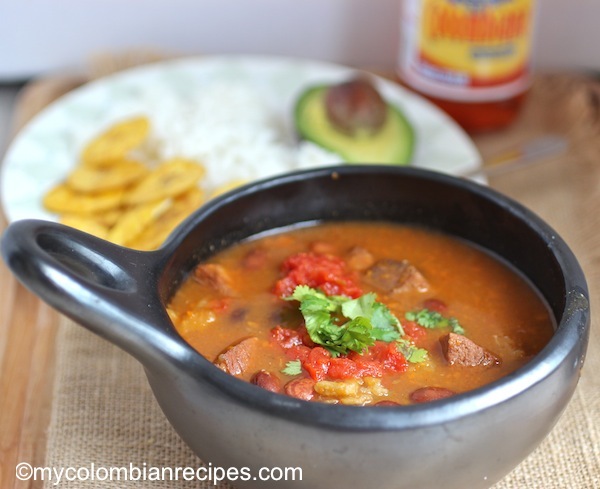 Great authentic Colombian flavor. Be sure to shred meat from ham hock into the beans. Have grated panela (natural brown sugar) to go with chicharron, fried sweet plantains ad avocado. Beware cooking times. I cooked mine for only 1 1/2 hours on the stove and they were close to mushy. I checked instructions on a Goya bag and they call for 1 hour and 20 minutes. I got cranberry beans at an Amish store in Blue Ridge, Ga. Then found Goya brand Cargamentos , 2 types, light and dark red at Buford Farmers Market in Atlanta. What can you use instead of pork ? Beef or just beef or vegetable stock for a vegetarian version. I made this recipe and it was so delicious!Gorgeous blog! So very beautifully done. The photos are so inspirational, plan to try out each of your recipes…thank you for sharing! Erica, this looks delicious! Love, love a good bowl of beans. This is my second time using this recipe. The first time the beans came out delicious and I got great reviews. This time, I am waiting to here from my biggest critic…The Colombian mother in law. These were amazing. Just like my mother makes them only I didn’t have the recipe. She’s still alive but back in Colombia, and I’m not. Thank you! My mom is colombian and let me tell you she throws down in the kitchen… basically everything i make she somehow makes it better! Last year i took my husband to Colombia and he fell in love with the bandeja paisa so we come home and i decide to make it for the whole fam. I came across your recipe and to this day my mom does not stop talking about the frijoles! We’re making it again for my anniversary tomorrow but im only allowed to do the frijoles! lol THANK YOU SO MUCH!!! i finally have one up on my mom! I went looking for interesting beans in Kensington Market in Toronto, and found cargamiento and bolas rojas at a Latin American grocery store. Since I had no idea what to do with them I searched and found your recipe. 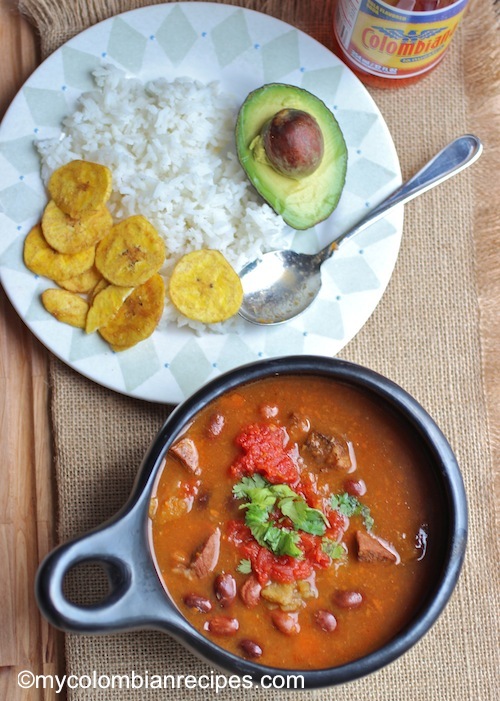 I used it as a very rough guide (which is how I generally relate to recipes) to make a pretty good stew with bolas rojas, green plantain, tomatoes, leeks (it’s what I had in the fridge! ), peppers and cilantro. For the bolas rojas I soaked for about 20 hours, then cooked in an instapot pressure cooker for 25 minutes at 15 lbs pressure, which was probably too long (next time I’ll try 20 minutes). Never been to Colombia but really enjoyed this dish, which granted is a rather loose interpretation of what you provided. Thanks!